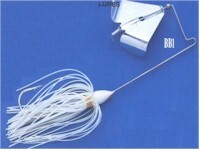 A buzzbait is a specialized topwater form of a bass jig. Its strength is that it's more snagless and you can cover more water faster with a buzzbait than with most other topwaters. Its strength is that it's more snagless and you can cover more water faster with a buzzbait than with most other topwaters. The biggest disadvantage of the buzzbait is the fact bass often completely miss it or strike short. Buzzbaits are most productive, especially in late spring when the fish are coming off their spawning beds.